Systole: The phase of the cardiac cycle when the heart is contracting and "at work"
P wave: The wave on an EKG or ECG that represents atrial depolarization and atrial contraction during atrial systole. PR interval: Also called the PR segment, it is the space on the EKG or ECG between the P wave and the R of the QRS complex. QRS complex: The wave on an EKG or ECG that represents atrial repolarization and ventricular depolarization. ST segment: The space on the EKG or ECG between the S and the T wave. 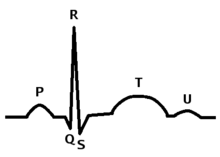 The QT interval: The space between the beginning of Q wave and the end of the T wave. T wave: The wave on an EKG or ECG that represents the repolarization of the ventricles. Angina or angina pectoris: Chest pain that results from the lack of adequate oxygen to the heart muscle. The lack of oxygen to the heart muscle is referred to as ischemia. Coronary artery disease: Damage to the coronary or heart arteries. Coronary artery disease results from the build-up of plaque (atherosclerosis) in the coronary arteries. This build up of plaque leads to smaller and narrower vessels that are needed to supply the heart with its needed oxygenation and blood flow. Coronary artery disease is signalled with chest pain (angina). 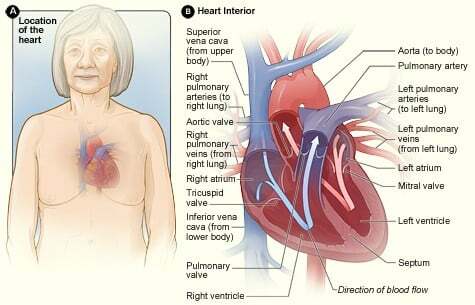 Heart valve disorders: Disorders that adversely affect the normal flow of blood from the right and left atria to the right and left ventricles of the heart and/or from the right and left ventricles to the pulmonary artery and the aorta, respectively. Heart infections: The invasion of a pathogen, or germ, that infects the heart. Cardiac arrhythmias: Irregular heart beats that can adversely affect the functioning of the heart and the transmission of its electrical impulse; some cardiac arrhythmias are life threatening. Cardiac dysrhythmias: Irregular heart beats that can adversely affect the functioning of the heart and the transmission of its electrical impulse; some cardiac dysrhythmias are life threatening. The human heart is a hollow organ that lies between the left and right lungs, slightly on the left side and quite close to the center of the chest. It is protected within the body by the ribs. The heart is an involuntary muscle that contracts and relaxes so that it is able to send and pump blood throughout the entire body. This pumping action is enabled by the electrical impulses that it conducts from and to the areas of the heart itself. The heart cycle consists of two phases which are systole and diastole. Systole is the contraction of the heart and diastole is the rest phase of the heart. Each beat of the heart consists of both systole and diastole. The "lub dub" of the heart is systole and diastole, respectively. Under normal circumstances, the heart beats from 60 to 100 times per minute or from 3,600 beats to 6,000 per hour. A pulse rate of less than 60 per minute is called bradycardia or a slower than normal heart rate and a pulse rate of more than 100 per minute is referred to as tachycardia or a more rapid than normal heart rate. The cardiac system consists of the heart and the cardiovascular system consists of the heart and the circulatory system which is described below in the next section. For the purpose of this study guide, the cardiac system and the circulatory system are discussed separately despite the fact that these two systems are anatomically connected to each other. Additionally, the respiratory system, which is also anatomically connected to the heart, was also discussed separately above. The above Figure A shows the location of the heart in the body. Figure B shows a cross-section of a healthy heart and its inside structures. The blue arrow shows the direction in which oxygen-poor blood flows through the heart to the lungs. The red arrow shows the direction in which oxygen-rich blood flows from the lungs into the heart and then out to the body. The pericardium is the sac that encloses the heart. The pericardium moistens the heart and it also protects the heart. The two layers of the pericardium are the serious layer and the fibrous layer. The myocardium is the muscular part of the heart. The muscles of the myocardium, referred to as cardiac muscles, not only contract and relax like other muscles in the body, but these cardiac muscles also conduct electrical impulses similar to what nerves do in terms of transmitting nerve impulses. The Purkinje fibers, which consist of a cluster or bundle of nerve tissues, allow the heart to conduct nerve impulses so that the heart can contract and relax each time the heart beats. The endocardium is the inner most layer of the heart. This innermost serous lining or membrane of the heart lines the heart valves and other anatomical structures of the heart. The right atrium, as shown in the picture above, anatomically lies at the top of the heart and on the right side of the heart. The right atrium receives deoxygenated blood that has already circulated throughout the body. Basically, this "used blood" enters the heart from the superior vena cava and the inferior vena cava, which are the main veins of the body. Arteries, veins, capillaries, arterioles and venules will be discussed below under the Circulatory System. The left atrium, as shown in the picture above, anatomically lies at the top of the heart and on the left side of the heart. The left atrium, in contrast to the right atrium, holds richly oxygenated blood that flows directly into the left atrium from the right and the left pulmonary veins from the lung where the unoxygenated "used blood" is reoxygenated. In contrast to the ventricles of the heart, the atria are smaller in size than the ventricles of the heart and the walls of the atria are thinner and less muscular than the ventricles. The right ventricle of the heart, as shown in the picture above, anatomically lies at the bottom of the heart and on the right side of the heart. The right ventricle receives deoxygenated blood from the right atria and it then pumps it from the heart to the lungs so the lungs are able to reoxygenate the "used blood". The right ventricle, in contrast to the left ventricle, is smaller and less muscular than the left ventricle of the heart. The left ventricle, as shown in the picture above, anatomically lies at the bottom of the heart and on the left side of the heart. 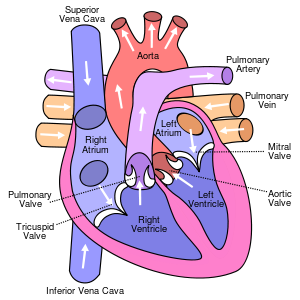 The left ventricle receives oxygenated blood from the left atria and it then pumps it from the heart to the rest of the body through the aorta, which is the largest and most major artery in the body, and the rest of the vessels of the circulatory system including the other arteries, the body's veins, capillaries, arterioles and venules. The left ventricle, in contrast to the right ventricle, is larger and more muscular than the right ventricle of the heart. The four chambers of the heart are separated from each other with septums. The ventricular septum, as the name suggests, separates the right ventricle from the left ventricle of the heart and the atrial septum, as the name suggests, separates the right atrium from the left atrium of the heart. The cardiac cycle, as above, begins again with each heart beat. Similar to inspiration and expiration as the respiratory cycle of the lungs, the heart has a cardiac cycle of contraction, which is the contraction of the heart that is referred to as systole, and of relaxation, which is the relaxation of the heart muscle for rest which is referred to as diastole. When a blood pressure is taken, the top number is the pressure of the heart during the contraction of the heart, or systole, and the bottom number is the pressure of the heart during relaxation and rest which is referred to as diastole of the heart. For example, a blood pressure of 120/80 means that the pressure exerted during the contraction of the heart, or systole, is 120; and the pressure exerted during relaxation and rest, diastole, is 80. The normal blood pressure for an adult is 120/80. When the blood pressure is significantly higher than 120/80, the person has hypertension or high blood pressure and when the blood pressure is significantly lower than 120/80, the person has hypotension or low blood pressure. Heart sounds, both normal and abnormal, can be heard with a stethoscope during the cardiac cycle as the heart valves open and close during both systole and diastole. The heart sounds that occur during systole and diastole are S1, S2, S3, and S4. Heart murmurs can also be heard with a stethoscope during the cardiac cycle as the heart valves open and close during both systole and diastole. The valves of the heart insure and control the flow of blood from and through the heart so that the flow of blood moves forward and it does not back up and go in the wrong direction. Heart valves are broadly categorized as atrioventricular valves and semilunar valves. The two atrioventricular valves separate and control the flow of blood from right atria to the right ventricle of the heart in order to prevent the back up of blood from the right ventricle of the heart back into the right atria of the heart and they also prevent the back up of blood from the left ventricle of the heart back into the left atria of the heart when the heart contracts during systole. The two semilunar valves separate and control the flow of blood from the heart's ventricles to the heart's major arteries; they prevent the back up of blood from the heart's major arteries back into the right ventricle of the heart and they also prevent the back up of blood from the heart's major arteries back to the left ventricle of the heart when the heart relaxes during diastole. The bicuspid valve, also referred to as the mitral valve and as shown in the picture above, anatomically lies on the left side of the heart and it separates and controls the blood flow from the left atria of the heart to the left ventricle of the heart without any back flow. The bicuspid valve is an atrioventricular valve. The tricuspid valve, as shown in the picture above, anatomically lies on the right side of the heart and it separates and controls the blood flow from the right atria of the heart to the right ventricle of the heart without any back flow. The tricuspid valve is also an atrioventricular valve. The pulmonary valve, as shown in the picture above, anatomically lies on the right side of the heart and it separates and controls the blood flow from the right ventricle of the heart to the pulmonary artery without any back flow. The pulmonary valve is a semilunar valve. The aortic valve, as shown in the picture above, anatomically lies on the left side of the heart and it separates and controls the blood flow from the left ventricle of the heart to the aorta without any back flow. The aortic valve is also a semilunar valve. Simply stated, there are two major systems of circulation to, through and from the heart. These two circulatory systems and pathways are the systemic circulation which moves oxygenated blood to the rest of the body and the pulmonary circulation pathway which moves blood to the lungs for reoxygenation and then back to the heart. The right side of the heart has the pulmonary circulation pathway which moves blood to the lungs for reoxygenation and the left side of the heart has the systemic circulation which moves oxygenated blood to the rest of the body. The systemic circulation pathway begins after the last phase of the pulmonary circulation pathway. The systemic circulation pathway begins after the pulmonary artery carries the deoxygenated blood into the lungs for reoxygenation. NOTE: The pulmonary veins from the lungs to the left atrium of the heart are the ONLY veins in the entire body that carry freshly oxygenated blood. ALL of the other veins in the body carry deoxygenated blood. It is the arteries of the body, and NOT the veins, that carry oxygenated blood with the exception of the pulmonary veins. CG Animated Human Heart cut section showing the atria, ventricles and valves, synced with wiggers diagram. The work of the heart is NOT voluntary; it is automatic as based on a number of mechanical and electrical mechanisms that occur within the heart muscle itself. The two major electrical conductors of the heart are the atrioventricular (AV) node and the sinoatrial (SA) node within the heart. Schematic representation of the sinoatrial node and the atrioventricular bundle of His. The location of the SA node is shown in blue. 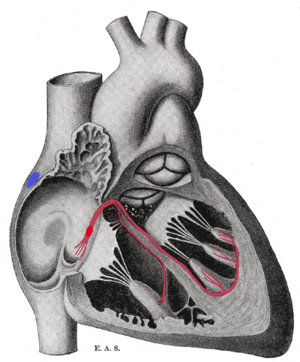 The bundle, represented in red, originates near the orifice of the coronary sinus, undergoes slight enlargement to form the AV node. The AV node tapers down into the bundle of HIS, which passes into the ventricular septum and divides into two bundle branches, the left and right bundles. The ultimate distribution cannot be completely shown in this diagram. The sinoatrial (SA) node within the heart, which is referred to as the natural heart pacemaker and the sinus node, not only controls the rate of the heart, or pulse, the sinoatrial (SA) node also initiates and begins the cardiac cycle by sending an electrical impulse to the right and left atria so that they contract and move the blood from the right and left atria to the right and left ventricles of the heart. The SA node additionally sends an electrical impulse to the atrioventricular (AV) node which in turn sends an electrical impulse to the bundle of His which then sends an electrical impulse to a bundle of nerve fibers called the Purkinje fibers which innervate, or lead to, the contraction of the right and left ventricles of the heart. Cardiac arrhythmias, or dysrhythmias, are irregular heart beast. Cardiac arrhythmias occur when, for one reason or another, the electrical activity is abnormal. Asystole, also called a flat line, is no heart beat at all. Asystole is cardiac death. An electrocardiogram, also referred to as an EKG or an ECG, detects and displays the electrical and mechanical activities of the heart. The parts of a QRS complex. Ventricular systole begins at the QRS; atrial systole begins at P In an electrocardiogram, electrical systole of the ventricles begins at the beginning of the QRS complex. As shown above, with a normal heart cycle, the P wave represents atrial depolarization and atrial contraction during atrial systole. The PR interval, also called the PR segment, is the space on the EKG or ECG between the P wave and the R of the QRS complex. The QRS complex represents atrial repolarization and ventricular depolarization. The ST segment is the space on the EKG or ECG between the S and the T wave. The QT interval is the space between the beginning of Q and the end of the T wave. The T wave represents the repolarization of the ventricles. Pulse is one of the four vital signs which include the pulse rate per minute, the blood pressure, the respiratory rate per minute and the bodily temperature. The normal pulse rate for the adult ranges from 60 beats per minute to 100 beats per minute. Each beat consists of the combination of one cardiac cycle of diastole and one cardiac cycle of systole. Each lub dub is one beat of the heart. Pulse rates can be measured at a number of sites, including the apical area over the heart, near the radius in the wrist area, in the temporal area of the head, in the carotid area of the neck, on the inner aspect of the arm in the brachial area, in the groin area and in the lower legs behind the knee, on the front of the foot and near the ankle. All of these pulse points, except the apical pulse, are done using the index and middle fingers; a stethoscope is needed to listen to the pulse over the heart in the apical area. Many disorders and disease can adversely affect the cardiac system and heart functioning. Some of these disorders can be congenital and others can be acquired. Congenital heart disorders affect the infant in the uterus before they are born. For example, a neonate, or newborn, can be born with a hole in the heart between the right and left atria or the right and left ventricles.